It is that time of year again! Pumpkin is everywhere! 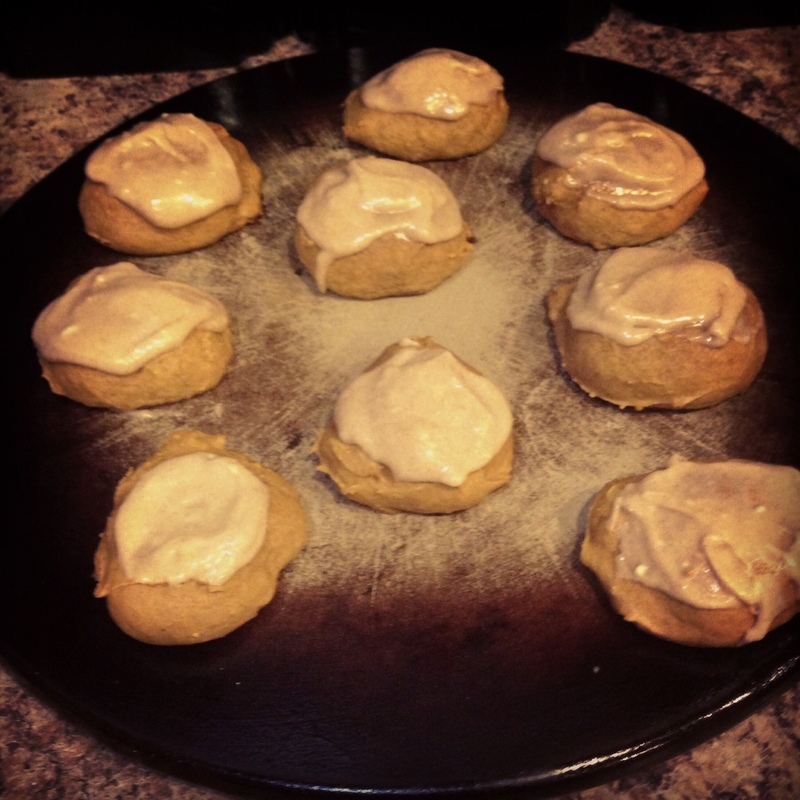 Pumpkin patches, pumpkin carving, pumpkin pie, pumpkin spice lattés and, my new fall favorite, pumpkin spice frosted cookies. I found the recipe to these little pieces of heaven on Pinterest. They are delicious but also highly addictive. I know that as students we do not have tons of time to just sit around and bake, but we all need to take tasty breaks, especially during crunch time. This recipe is super simple. They are from scratch, so you might have to do some shopping. Here are the ingredients that you will need. 1. This first thing you need to do is preheat the oven to 350 degrees. 2. Then, in one bowl, mix together all your dry ingredients for the cookie dough. Combine the flour, baking powder, baking soda, cinnamon, nutmeg, ground cloves and salt. 3. In a different bowl you are going to mix together the ½ cup of butter and the sugar. (Do not try that mixture; it is not very good…believe me). 4. After you have mixed the butter and sugar, you are going to mix in the pumpkin, the egg and the vanilla to it. mixing in all the dry ingredients to the wet mixture. When I made these I used a kitchen aid mixer. However, you can use a normal mixer, or you can stir it by hand. It might take a bit longer to do it that way, but the reward will be worth the effort! 6. After everything is all mixed together, you then use a tablespoon to scoop some of the dough onto a greased cookie sheet. Because the dough will be sticky, I would suggest spraying the spoon with Pam or whatever non-stick cooking spray you use. They should then slide right off the spoon. 7. You bake these in the oven for 15 to 20 minutes. 15 minutes was just right for me. While the cookies are baking, you can begin making the tasty frosting. It is super simple, and you are definitely going to want to taste test it. 1. First, you mix together your butter and cream cheese until it becomes super creamy. 2. After you have mixed those together, you mix in the powdered sugar. Mix that until it becomes nice and thick, and then add in the cinnamon and the teaspoon of vanilla. cool, you can add your frosting to them! When I made these, I was a little concerned that the cookies seemed a little “spongy” but that is more than okay; that is just the way that pumpkin bakes. These cookies are really dense and are more like little pieces of cake. favorite things to do. This recipe will be one that will definitely become a frequent staple in my baking repertoire. I hope that you try to make some of these delicious cookies, and I want to hear what you have been cooking on campus!